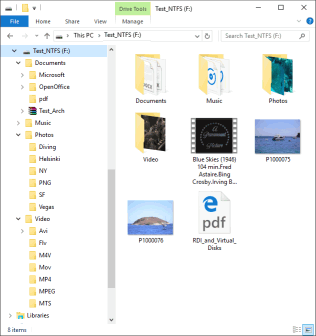 NTFS, which stands for New Technology File System, was originally developed by Microsoft and is primarily used in Windows machines. 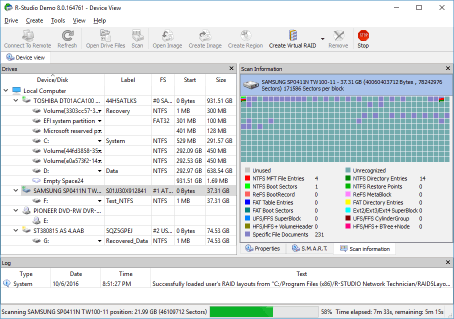 Practically every computer using Windows will have an NTFS-formatted disk. NTFS disks can even be mounted as read-only disks by Mac OS X by default. With third-party software, Apple computers can even get read/write access NTFS disks. Likewise, many Linux systems support read and write operations for NTFS disks. 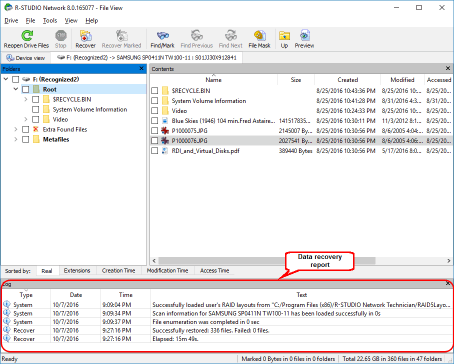 For this reason, many external disks come pre-formatted as NTFS devices. 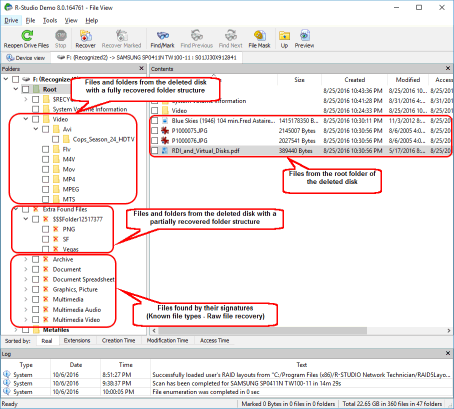 To meet the growing need for data recovery capabilities with the latest file systems, R-Studio comes fully equipped with the ability to recover data from an NTFS disk. The drive you are attempting to recover is a disk with a reformatted NTFS partition. After setting up the files, we performed a disk reformat using the Disk Management tool in Windows. Upon doing this, the disk will initially appear completely blank. Note: We'll use the Windows version of R-Studio to show the data recovery process, but these directions are fully applicable to the Mac and Linux versions of R-Studio. The panels and dialog boxes will have a different look and feel, but the functionality is the same. Connect the disk to the R-Studio computer. Use the fastest interface available: the SATA ports are the fastest, but USB 3.0 is sufficiently fast as well. 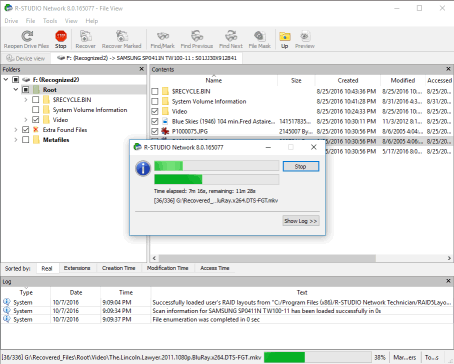 USB 2.0 may be too slow for large disks. Note that many external USB drives have additional eSATA interfaces. Start R-Studio and locate the reformatted disk and the disk where you want to store your recovered files. 3. Since we know the file system we are trying to recover from, we can improve R-Studio's results and performance by specifying the file system of the reformatted disk. Click the Change... button next to File Systems and leave only the NTFS file system selected. Optional: Check the option to "Save to File" and specify a save location. 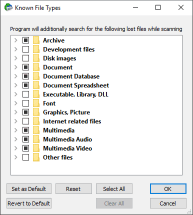 This will save your disk scan information, so you can resume where you left off if your disk scan is interrupted, or if you want to recovery more files in another session. 6. Inspect the scan results and find the recognized partition which corresponds to the deleted disk. If other partitions previously resided on the disk, R-Studio may find them. You will have to determine which of the recognized partitions is the one you are looking for. In most cases, the partition you are attempting to recover will be the same size as the existing logical disk. 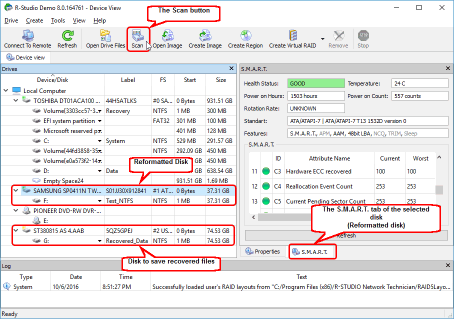 See R-Studio online help for more details: Data Recovery Using R-Studio. 7. 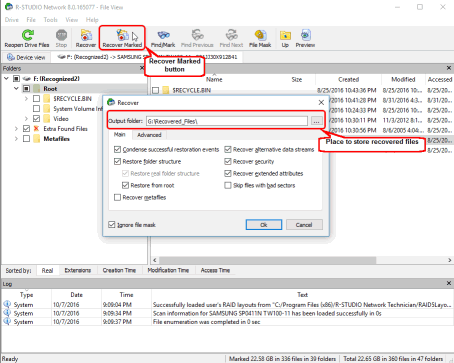 Double-click the Recognized2 partition. R-Studio will enumerate files on it and show the folder tree. First, let's take a look at the files recovered from the remnants of the previous file system. Usually, files from these sections are given an automatically generated file name, such as 001.dat, 245.xml, etc. 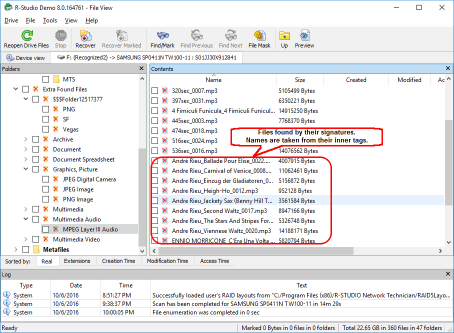 But if you see a file in this section with a correct filename and timestamp, that means that it's also been found in the remnants of the previous file system, and it's not necessary to recover it as part of the raw file recovery process. It will be recovered from the file system remnants with a proper filename, timestamps, and within its folder tree. 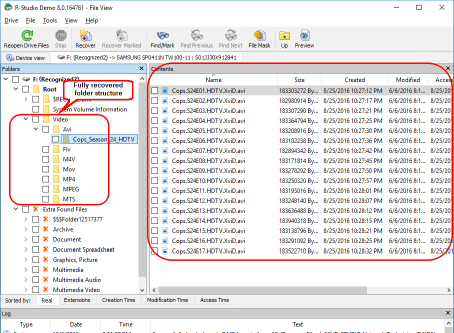 Some file types can contain document names, timestamps, and some other attributes within the files in their inner tags. R-Studio can read some tags and use them in an attempt to give meaningful file names and timestamps. 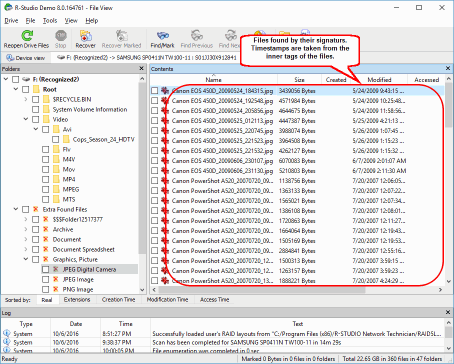 It is important to recognize which file attributes are from the remnants of the previous file systems and which from the file inner tags. Generally, it can be done by looking at file names and timestamps, etc. 9. 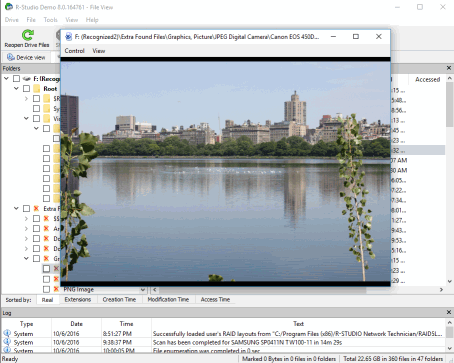 Use the built-in Previewer to estimate chances for successful data recovery. This is particularly useful with large picture files. Double-click a file to preview it. 10. 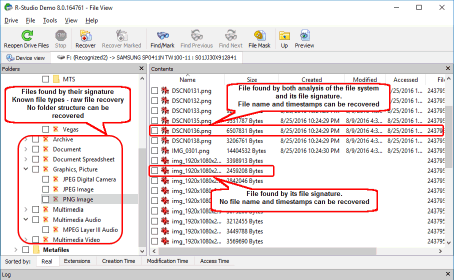 Select the files and folders you want to recover and specify a save location for your restored files. 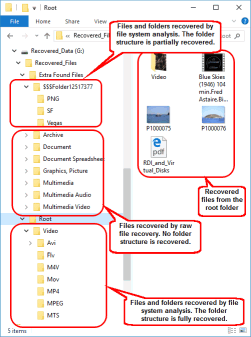 For our test scenario, you can see that many files and folders were correctly recovered with correct filenames and all other their attributes. But some first-level folders in the root folder lost their filenames. 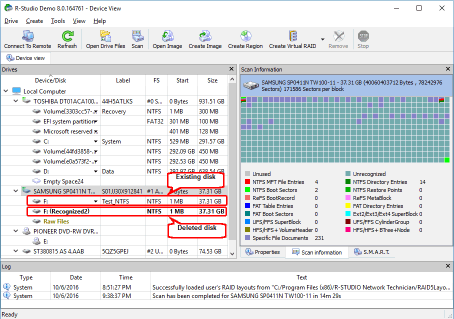 Our test case has proven that R-Studio is an effective tool for recovering data from NTFS disks after they have been reformatted. In our test scenario, we had a 100% success rate in terms of recovering the data from all the files that were on the deleted partition. This success is owed in part to the fact that no new data was written to the disk after the deletion occurred. 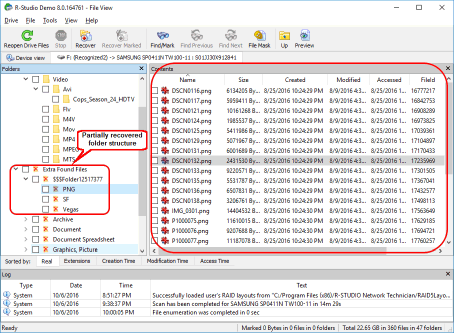 Your mileage will vary depending on your specific data recovery scenario, but in most cases, a combination of R-Studio's analysis of the previous file system on the disk and a Search for Known File Types will recover most of the data on the disk. In the latter case, the files and folder names in the root folder may be lost, but the data will be intact. 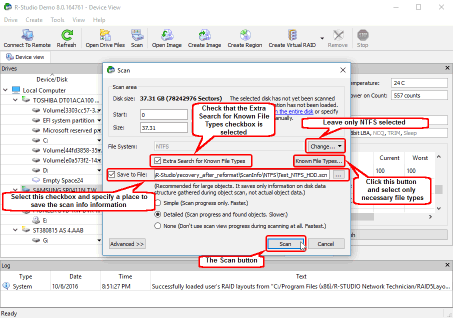 If you have an NTFS disk that has been accidentally reformatted, try performing the steps above in the demo mode of R-Studio. If you can successfully find and preview the files you are looking for, go ahead and register the product to get your files back. As long as your drive is in good physical shape and you do not write any new data to the disk, attempting a data recovery with R-Studio in demo mode is risk-free and can tell you immediately if your data is recoverable.